Is there a w123 transmission mount test? Did my engine mounts, one was somewhat compressed (not terribly but to be expected). Engine stop and AT mount look great. But if I’m doing other work, would like to determine if they are needed. I guess I could do them anytime in the future... but is there a “simple” test besides their look, to see if replacement is prudent? I check to see if mounts are compressed or coming apart, as well as give them a few good pokes to see how soft they are. Every mount I've touched on my '79 240D has been bad (pretty much rock solid), which probably was exasperated by the 4 cylinder vibrating more than the 5 cylinder would. I had low compression on one cylinder (when the OM616 still ran) which made the shaking worse. I like to replace all the mounts. That’s the thing. My 240d is really clean and always garage kept. Low miles. The rubber is soft and not cracked. Which is what makes it confusing to me. I get the general concept to replace everything, but given the quality of many parts anymore due to offshoring, I might be better off keeping the OE part. The corner on the left of the pic looks like you had a fluid leak on it softened and swelled a little. I’ll have to look again. As I recall, that’s the thin clear semi-glossy coating that flakes off. But noted and need to look again. Even if so, it’s not apparent to me that the mount has sagged or failed. Perhaps not perfect but appears quite serviceable. I doubt a meaningful test really exists. Badly rotted or really compressed I would think otherwise. It is also not a situation where that part is going to leave you stranded on the side of the road. Normally I would agree, but a rubber mount that's been in the car for 35+ years is something I would replace regardless (though I would keep the original around, just in case). Would you drive on a spare that's been in clean dry trunk for 35 years? That said, there are issues with quality on new parts. Cheap motor mounts lasted me 8 months before collapsing worse than the old ones. I got a new trans mount (granted, it was from autozone) for my '96 Civic about 3 months ago and it's already gone bad. I do beat the crap out of that car daily, but a motor or trans mount should last longer than 3 months. I'm assuming you also have the manual transmission? My mount looked similar before I replaced it... and now I honestly can't tell much difference, if any at all. 1981 240D 4sp manual. Ivory White. You will notice bad mounts way more in an auto than in a manual. 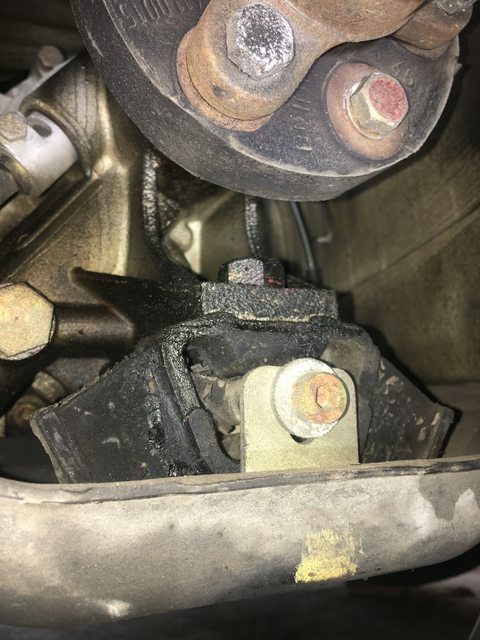 When I purchased my 220D the PO didn't have a transmission mount attached at all. It looks ok, but if you're planning on doing any work on the drive shaft, I'd replace him while you're in there. Replacing mine improved the coasting . Felt tighter. The mounts are cheap so why not?